George Kellaway and Sarah Sargant were married on 29 January 1788 at St George′s Southwark but his origins, born about 1763, remain a mystery. We know his descendents carry the same DNA as the US Peter Callaway line but so far this link has not proved decisive. We also know that for some reason he was buried in Dorchester, Dorset, but again the motive for this is unknown. 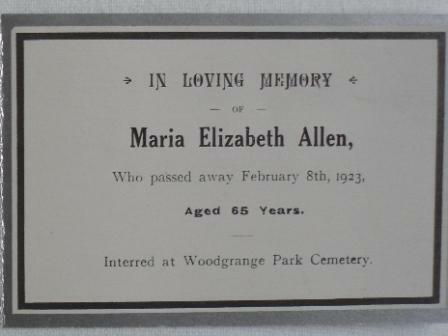 Here are some of the photographs and memorial cards which relate to the family. 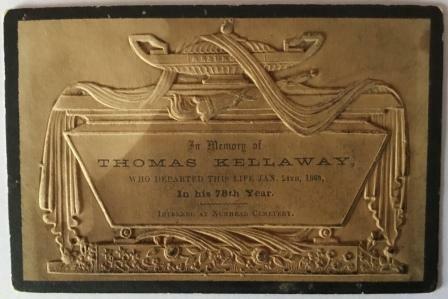 Thomas′ eldest son was George Thomas Kellaway (1812-1866). George′s eldest daughter Mary Ann married a printer and bookbinder John Diprose of Messrs Diprose & Bateman in 1868. 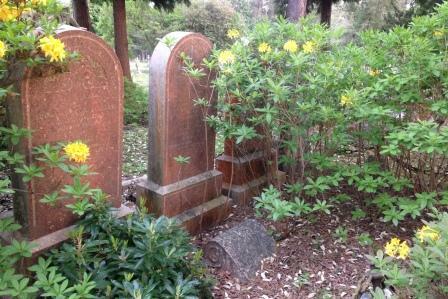 These are their graves at the Diprose plot in Brookwood Cemetery, Surrey. 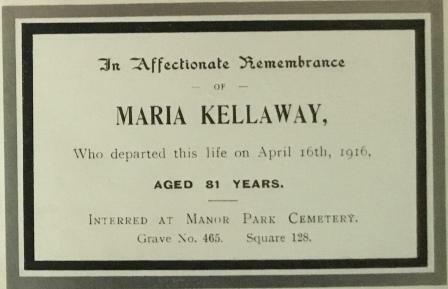 Funeral arrangements were made by Herbert Arthur Kellaway Undertakers of Camberwell and Dulwich, the son of Mary Ann′s brother Thomas Charles Kellaway. 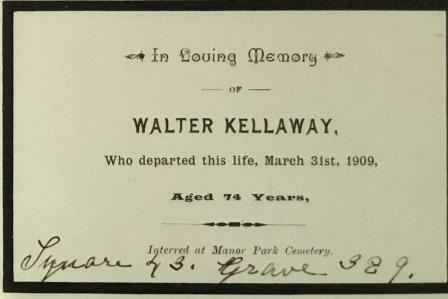 Thomas Kellaway′s youngest son was Walter Kellaway 1834-1909. 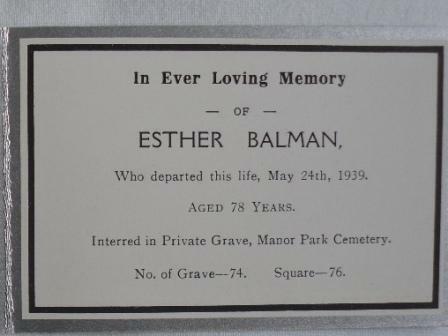 He married Maria Basham 21 June 1856 and they had 2 sons and six daughters. Walter and Maria′s oldest daughter Maria Elizabeth married James Allen in 1892 and the third daughter, Esther married Henry W Balman 1884. 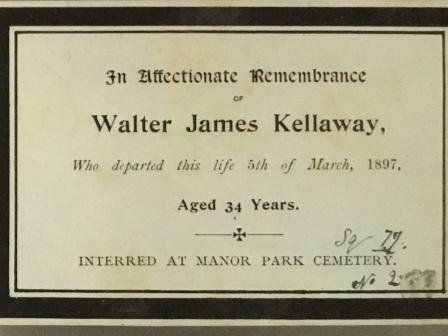 The eldest son Walter James married and had 3 daughters and one son but died young in 1897 aged 34. 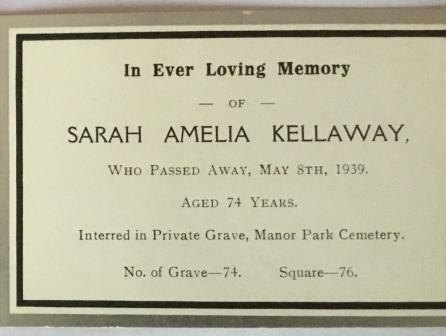 Sarah Amelia died unmarried in 1939 and son William, also unmarried, died in 1910. Here are their memorial Cards. 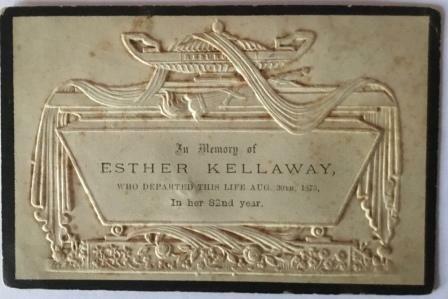 Thomas and Esther had another son Edwin Lauriston Kellaway whose descendents became quite famous in the entertainment world. 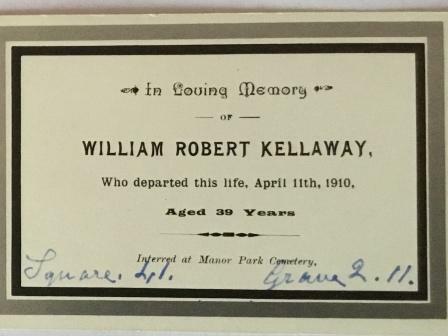 Edwin′s eldest son was Edwin John Kellaway b.1847. 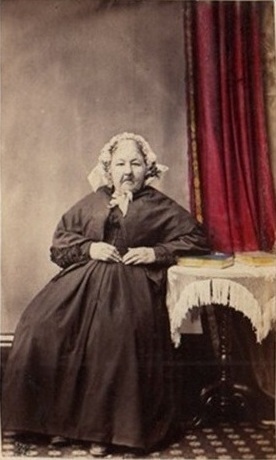 He first married Ann Butcher in 1867 and had 3 children with her before she died in 1882. 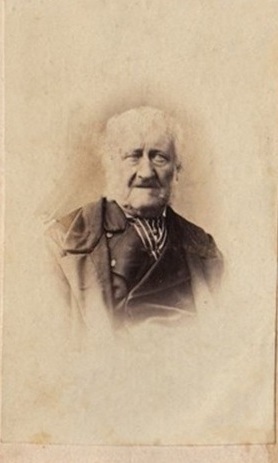 Edwin and two sons moved to South Africa before 1887 where Edwin married Rebecca A Brebnor known as Bertha. They had 7 children, 2 daughters and 5 sons. 6 were born in South Africa and one son on a brief return to the UK in 1900-1901. Of the sons 4 became actors, dancers and entertainers initially in South Africa. Cecil Kellaway was a Holywood actor and moved to Australia and then California where he died 1973. Alexander (Alec) with wife Sylvia and Herbert Brebnor (Jack) Kellaway moved to Australia where they were known as comedians and entertainers in various troupes. Harold Lionel Jack known as Leon Kellaway was a successful ballet dancer and teacher in Australia. While dancing he toured in many countries but finally settled in Sydney and opened his ballet school in 1937.